Imagine that you have left your home for a week-long vacation. Halfway to your destination, you remember that you have forgotten to setup back your air conditioner and turn off several lights in your house. While this realization of wasted energy costs could put a damper on your vacation, you instead pull out your mobile device, accessing your home automation system and adjust your air conditioner and turn off all lights in your home with just a few taps. The Home Theater Company helps you save money and breathe a little easier with our state-of-the-art home and business automation packages. You can check security surveillance for your home at any hour, adjust the volume on music broadcast throughout your house and even adjust the desired home temperature without moving from your chair. 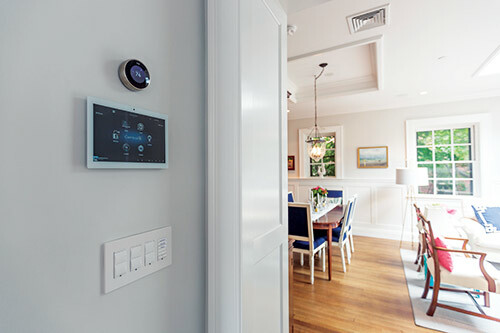 Our Home Automation Technology helps you consolidate control of multiple systems with a single user-friendly interface that gives you complete control of your home. Allow us at The Home Theater Company to place you on the cutting edge of systems control and turn your home into a streamlined and modern masterpiece.